If you are pre-ordering a Galaxy S7 or Galaxy S7 Edge, or you own a Galaxy Note 5, Verizon currently has a fast charging accessory bundle on pre-order that you may want to take a look at. 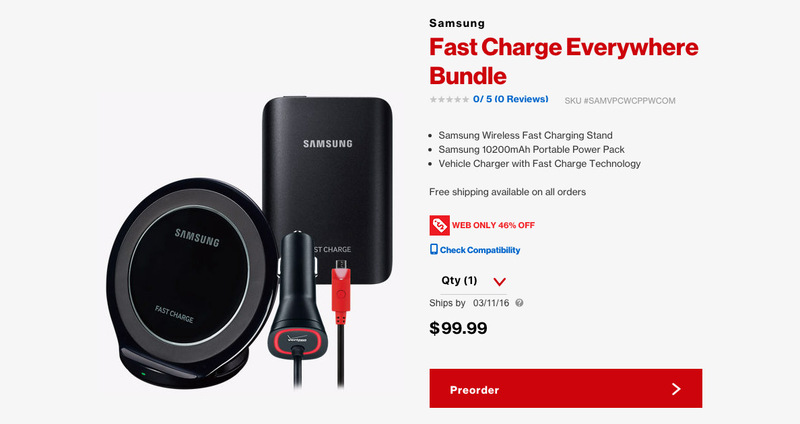 The bundle includes a Samsung fast wireless charger, Samsung 10200mAh battery pack, and a car charger with “fast charge technology” for just $99.99. I know that $100 for a bundle of accessories doesn’t seem cheap, but when you start to add up the parts individually, you are actually saving quite a bit of cash. The Samsung fast wireless charger is the new version that lays flat or can be propped up as a phone stand and costs $70 by itself. The 10200mAh battery pack is also the newest from Samsung that features fast charging and is $80 by itself. The car charger, well, it appears to be some sort of 3rd party deal that Verizon slapped their logo on. It’ll probably push a fast enough current through your S7, though, assuming it doesn’t blow it up. Overall, Verizon claims the savings here are around $85. Even if you don’t care about the cheap car charger, you are still saving $50 off the official Samsung products. This is technically a pre-order for the bundle with shipping happening on or around March 11.